Q: What is a WAGS Ambassador Team? A: It is a Certified Pet and their Human Handler! What Does a Certified Ambassador Team Do? A certified WAGS Ambassador Team is a human-animal team that interacts with and provides social interaction for the purpose of enhancing quality of life for the patient/client/child/senior adult/or other person receiving visits. Click here to view the many places we visit. Becoming a WAGS Ambassador Team usually takes 6 months or more from the time you join until you successfully pass your evaluation, and make your first visit with your pet. Why so long? To ensure that all WAGS Ambassador Teams meet the highest standards of behavior, sociability, manners, and health for the safety and well-being of the facilities and the populations that we visit. This includes meeting pet therapy standards, and the safety/regulatory requirements of most facilities that we visit. 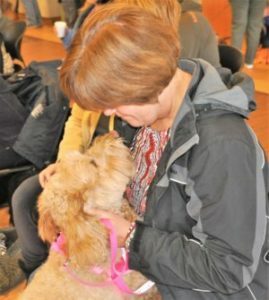 Handlers ages 12-17 are welcomed for all WAGS' meetings, visits, and events if accompanied by a parent or guardian. Young handlers must have their parent or guardian's written permission to participate. If you do not own a pet, obtain written permission from the owner to train and test with their animal. The handler and pet function as a team and must always be tested together as a team. Wags has defined pet categories that are allowed to become certified. Please refer to our Pet Requirements.